Dextrex manufactures lubricant additives and hydrochloric acid at two plants in the Midwest. After the recent sale of its plastics subsidiary, Detrex is extraordinarily overcapitalized and ripe for a takeover or other strategic transaction. Detrex sells its specialized additives and highly purified acid command a healthy margin, making the company strongly profitable. Unfortunately, the company has been afflicted by ongoing environmental charges related to past activities at the company’s former manufacturing sights. There is not telling how long these charges will continue, but they have not stopped the company from putting up strong profits. 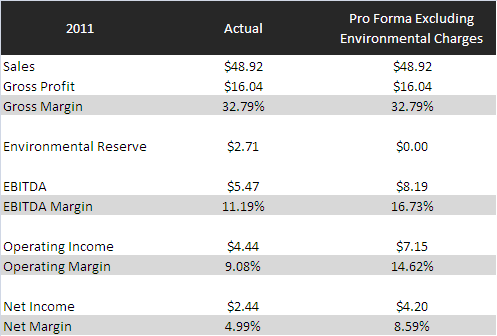 Here’s a look at Detrex’s 2011 results, with and without the environmental charges. While strongly profitable in 2011, Detrex has the potential to be nearly twice as profitable in the future if environmental charges abate. Detrex has an impressive balance sheet to go along with its strong operating results. The company received after-tax proceeds of $30 million from the sale of its plastics unit in January 2012, which it used to pay off bank debt and pay a special dividend. Most of the cash remains on the balance sheet as the company considers its alternatives. At an enterprise value of $15.26 million, Detrex trades at 2.79 times EBITDA and 3.44 times operating income. By comparison, other specialty chemical companies with similar margins trade at much higher multiples. On average, similarly profitable specialty chemical companies trade at significantly higher EV/EBITDA and EV/Operating Income multiples. Detrex’s tiny size and poor liquidity merit a discount from competitor averages, but not of this magnitude. The chart below summarizes Detrex’s value per share under a number of different EBITDA and valuation scenarios. Even assuming that future environmental charges go up by 50%, any reasonable valuation multiple gives a share value for Detrex well above the current $16.14 bid/ask mid-point. Assuming a constant EBITDA and a 6.0x EV/EBITDA multiple (76.5% of peer average) gives a share value of $26.51, a 64.3% advance from current levels. Any future reduction in annual environmental charges would only increase the company’s fair value. While investors wait for Detrex’s value to revert to the mean, they will be rewarded with a 25 cent per quarter dividend that Detrex initiated this month. This 6.2% yield will add meaningfully to Detrex’s total return. Risks to investors include the possibility that Detrex will be found liable for hugely costly additional environmental cleanups, or that management will squander excess cash on a poor acquisition. Disclosure: Detrex Corp. is one of my portfolio’s largest positions and I plan to buy more share in the near future. 4 Responses to Detrex Corp.
To me, a key question is why is Elco so much more profitable today than it was for the last decade? Did something in the industry change that allows Elco to sustain their current profitability? Do they compete head-to-head with Lubrizol? It seems like there should be economies of scale in the petroleum additives business – which would seem to favor larger companies. I can’t understand their niche. That question has occurred to me too. From the company’s annual report: “Elco’s strong growth was fueled primarily by substantial revenue gains in the export markets.” Apparently, some overseas customers really like Elco’s output. Beyond petroleum additives, Elco’s products are also used in the semiconductor industry, which has been doing much better of late. The company has a good deal of operating leverage as well, so operating margin rises quickly when revenues increase. I hope the company’s expressed optimism for 2012 holds up and the $2.3 million in capex spending on Elco is a worthy investment. 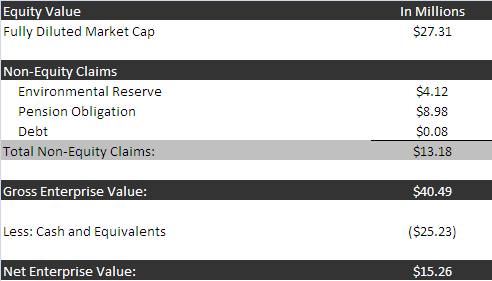 So far the position in Detrex has worked for me, but I really wish I’d gotten in last year when the stock was under $10, not even counting the special $2 dividend. Used to do experience examining articles and surveys and assessments appeared. They are exceptionally sensational you can get diverse incredible getting ready.